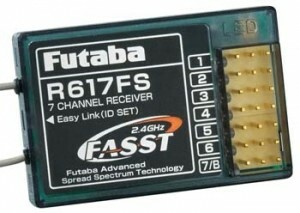 Corona 2.4GHz Spread spectrum FASST compatible receiver. Functions in both FASST 7 channel and FASST multi-channel modes. Low speed mode is of analog servos, high speed for digital servos. Includes instructions. Low speed mode used for analog servos, high speed for digital servos. Includes instructions. 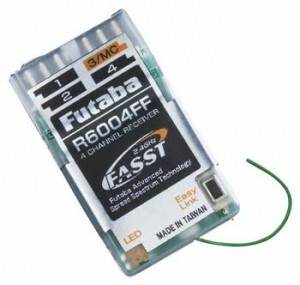 This is the Futaba R6004FF 2.4GHz FASST 4-Channel Micro Receiver. Compatible with the following FASST transmitters; 6EX, 7C, and the following transmitter modules; TM7, TM8 (on 7 channel mode), TM10 (on 7 channel mode) and TM14 (on 7 channel mode). 8.5 volts, Futaba recommends you follow the voltage specs of your servos). FEATURES: High sensitivity receiver weighs only .25oz (7g) without case yet is a full range system for all aircraft from giant scale to park flyer applications-no need to buy separ te receiver for specific aircraft. Simple one-touch linking - no plugs to mess with or lose Dual Antenna Diversity allows 2.4GHz FASST. 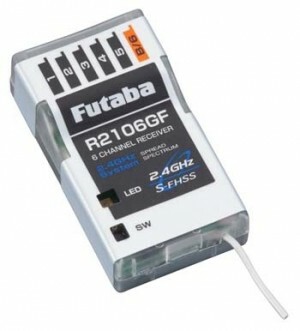 Futaba transmitter to select the best reception between the two receiver antennas with no signal loss. 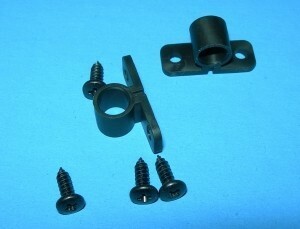 Rubber grommets installed where antennas exit to eliminate stress and fraying of the two antenna wires. One year limited warranty. Sorry, temporarily out of stock, manufacturer back order. 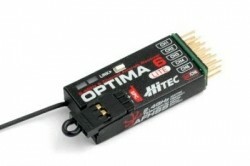 Hitec put the already lightweight Optima 6 on a diet and came up with the Optima 6 Lite. Built with a thin Lexan case and weighing under 10 grams, our ultra-dependable, full-range 6-channel receiver is the perfect answer for small aircraft. The Optima 6 Lite utilizes our 2.4GHz AFHSS technology, exclusive single Boosted Omni-Directional Antenna and selectable Scan Mode ensuring an interference-free, full-range connection at an unbeatable price. Lightweight and affordable - what else could you ask for? The Optima 6 is our smallest and least expensive 2.4GHz receiver. Built on the same foundation as the Optima 7 without the full telemetry features, the Optima 6 is 20% smaller and weighs in at just slightly over a half an ounce making it perfect for smaller aircraft. Adaptive Frequency Hopping Spread Spectrum Technology (AFHSS) The Optima 6 utilizes our AFHSS 2.4GHz technology and our exclusive Smart Scan system to ensure a rock solid, interference free connection. When selected, Hitec's 2.4GHz SmartScan function scans the 2.4GHz spectrum to find the cleanest channels in which to operate, therefore providing interference free operation even in the most crowded environments. Utilizing our advanced 2.4GHz AFHSS technology, our new full-range micro receiver, the 6T is the excellent choice for modelers flying smaller aircraft. The Minima 6T features a Top-pin configuration, our exclusive, dual-diversity Mini Boosted Omni-Directional Antenna (M-BODA). 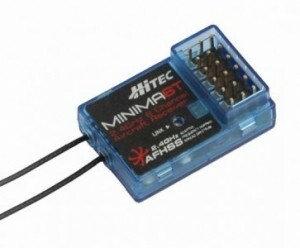 With wide voltage operation from 3.7-9.0 volts, this receiver brings more to your hobby. Notice: Minima 6 receivers require that the module or transmitter have firmware version 3.01 installed to operate. For more information on firmware version. Find at www.hitecrcd.com. Get the MAX when you buy a Minima 6E or 6T. 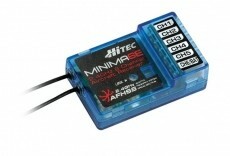 Purchase a Minima 6E or 6T receiver between now and 12/31/2011, and get a HPP-22 interface for just $9.99. Download the offer form at www.hitecrcd.com. Restrictions apply. This items is 2 each Optima 6 Receivers loose packaging. 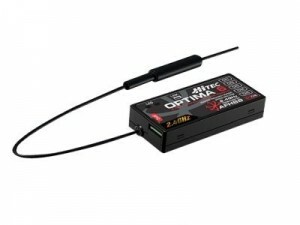 The Optima 6 is our smallest and least expensive 2.4GHz receiver. Built on the same foundation as the Optima 7 without the full telemetry features, the Optima 6 is 20% smaller and weighs in at just slightly over a half an ounce making it perfect for smaller aircraft. Note, this item is "Loose Packaging". Taken from other product packaging. Factory new and perfect. This items is 3 each Optima 6 Receivers loose packaging. 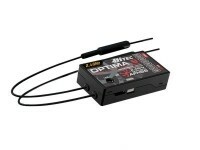 The Optima 6 is our smallest and least expensive 2.4GHz receiver. Built on the same foundation as the Optima 7 without the full telemetry features, the Optima 6 is 20% smaller and weighs in at just slightly over a half an ounce making it perfect for smaller aircraft. Utilizing our advanced 2.4GHz AFHSS technology, our new full-range micro receiver, the 6E is the excellent choice for modelers flying smaller aircraft. The Minima 6E features an end-pin configuration our exclusive, dual-diversity Mini Boosted Omni-Directional Antenna (M-BODA). 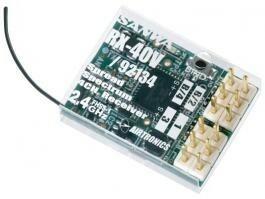 With wide voltage operation from 4.8 to 8.4 volts, this receiver brings more to your hobby. All same specifications as Hitec's vertical pin HRC26610 except this unit has horizontal pins for thinner locations. Ideal for most applications the Optima 7 is the workhorse of the Optima line of receivers. Featuring full telemetry capabilities and utilizing a dual end block design the Optima 7 is slim enough to fit in the tightest of spaces. Get 3 Hitec Optima 7 2.4GHZ RX's. Ideal for most applications the Optima 7 is the workhorse of the Optima line of receivers. Featuring full telemetry capabilities and utilizing a dual end block design the Optima 7 is slim enough to fit in the tightest of spaces. All the same features as HRC28425 above. 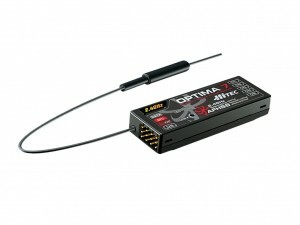 Factory 3 pack of Optima 9 Receivers. On sale through our Super Saturday Sale ending June 6. $40 discount, limited time only. All the same features as the 7 with 2 more channels. Sorry, We are not Horizon dealers. We do not sell Spectrum or JR brand receivers. The RX40V Vertical Pin RX is and axtremely small, lightweight, short-range receiver designed for indoor or limited range park flyer use. Cropping of image suggestes a super short antenna, actual length 7 3/16". This RX will function with all Airtronics 2.4 Aircraft Transmitters. Notes from Dave: This and the other park flyer RX from Airtronics are both rated at 100 meters or 330 feet. In testing the 6 channel, I found the rating to conservative to the extreeme being able to maintain link nearly out of sight overhead. I have not tested this unit but the 6ch is certainly good over 1000 feet in the air. If your unsure if if your model needs a full range RX or not, we invite you to phone in and we'll give you our reccomendations. I'll post actual test results here when I've had a chance to fly one of these. 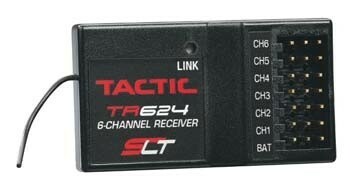 Tactic TR624 2.4GHz Six Channel Receiver. Features: Compatible with the Tactic TTX404, TTX600, and TTX650 stick transmitters. Built-in bind button with red LED status indicator, programmable fail-safe, no crystal required and lightweight. Comments from Dave: The Tactic radio's are very reliable, RX's are inexpensive, overall a fantastic value!